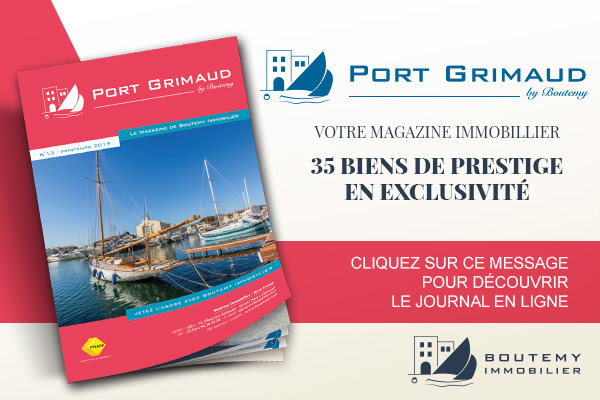 Our quarterly magazine is now available for free distribution in the streets of Port Grimaud! You will find a wide range of properties available for sale as well as testimonials from buyers of an apartment in Port Grimaud. Click the image to access the online magazine. In our Spring edition, we interviewed 3 recent apartment owners but due to publication constraints we were unable to publish all the questions we asked them. We therefore encourage you to read their full answers concerning their buying experience as well as their favorite addresses in Port Grimaud. In which neighborhood do you live? Viviane and José: We have acquired our accommodation in Grimaldines 1 in Port Grimaud 3. Its location which is close to the village center and the large beach as well as the property itself captivated us from the very first visit with Marion. After a brief conversation, we decided to buy this property. Julien: Our apartment is located in the heart of Port Grimaud 1. We love this district which is the first one you see when you reach Port Grimaud by sea. We appreciate the liveliness of the Place des Artisans on market days as much as the absolute calm that reigns on our private terrace. Do you spend a lot of time in your new place? Viviane and José: We have been the owners of our apartment since last September and plan to stay there as often as possible depending on our schedule, at any time of the year. Julien: We spend almost every holiday from April to October here, on long weekends and in August. What are your favorite spots and activities in Port Grimaud? Viviane and José: The main advantage of Port Grimaud is that we don’t need to use a car so we like to visit places like Saint-Tropez and Sainte-Maxime but most of the time we prefer the tranquility of Port Grimaud where we also enjoy parasailing activities, beach deck chairs and a little morning jog when the village is still dormant and the beach is deserted. Our holidays in Port Grimaud are really a refreshing holiday. We love Antinéa beach, where we spend a lot of time relaxing, taking long walks and savoring Manu’s delicious dishes. We enjoy the market cuisine, the Tartane and Cathy’s ever welcoming smile, as well as the Telline for its cuisine and its ever pleasant welcome. We recommend the Licorne for its more family-friendly cuisine and especially for the hospitality of the entire David and Fabienne team; it is always a pleasure to spend some time at their restaurant. And also the Marée where Christian and Valérie prepare delicious fish dishes for the guests.In fact, our favorite places in Port Grimaud are mostly related to very good human experiences we’ve had and are places where we feel at home. Julien: We like to spend time on the beach and take the boat to swim in front of the « madrague » (famous property acquired by Brigitte Bardot in 1958) in Saint-Tropez. We like to walk around, shop but more than anything else, visit the canals. When friends come to visit us, we always show them around Port Grimaud through the water. Our favorite restaurant is the Tartane. Cette entrée a été publiée dans English le 11 avril 2019 par Boutemyblog.